I remember that when I first lived in New Zealand I was always experiencing cultural differences that the native Kiwis failed to comprehend about American culture. I mean, they didnâ€™t eat staples like peanut butter and questioned the point of ketchup. But by far the one thing that drove my Kiwi friends bonkers was my love for cherry. I adore it – ice cream, candy, sodaâ€¦ you name it and cherry makes it better. For some unknown reason, cherry just wasnâ€™t popular down there. Well, itâ€™s a good thing then that my friends didnâ€™t attend the All Candy Expo and amble by the Gimbalâ€™s Fine Candy booth. Gimbalâ€™s is an interesting small candy manufacturer. They produce a variety of products from jelly beans to Lavaballs, with their factory being certified Kosher and gluten, nut, dairy, egg, soy, gelatin, and transfat free (not all of these products are vegan since some contain beeâ€™s wax). But of all their products, the one that blew me away the most was their Cherry Lovers. Cherry Lovers is a bag of heart-shaped chews consisting of nine different flavors of cherry. Thatâ€™s right, nine! Think thatâ€™s impossible? See for yourself…. Today I admit that I have learned an important lesson: Weird is not always better. 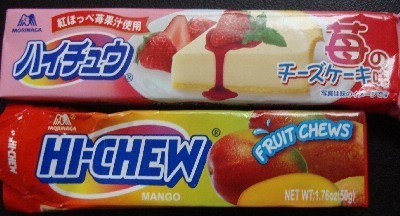 When our friends at J-List offered me my first chance to try the intriguing Japanese candy Hi-chew, I figured, why not go for the most exotic? So custard pudding flavor and Strawberry Cheesecake seemed like the obvious candidates. I mean, when have you looked at a display of American candy and seen something in cheesecake flavor? Never. There you go. As you can read in my previous review, the custard pudding flavor was fun and interesting. But I felt fine giving the rest of the package away. And the strawberry cheesecake…. Despite being siblings, my brother and I had differing opinions on everything. He was a Los Angeles Dodgers fan while I preferred the Angels. He liked sci-fi stuff, and Iâ€¦ well, I just didnâ€™t like/understand it. And even on Thanksgiving, the day of the year where all families sit down together, he and I were contentious. You see, my mom had this tradition where she would let one of her kids pick the dessert to create. He always wanted pumpkin pie while I craved blueberry cheesecake. It was always a tempestuous dinner if your dessert wasnâ€™t picked. 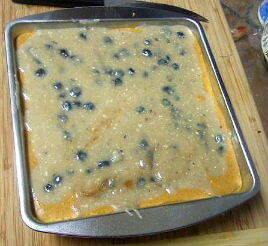 All these years later, I still like my preference over his, but in honor of the spirit of Thanksgiving, here is a candy recipe that combines both loves: A blueberry pumpkin cheesecake fudge bar that I call the Harmony Bar. Lifesavers were always one of those candies I shied away from buying as a kid. I found their flavors too artificial, and often only enjoyed one or two flavors per roll. I could never justify buying them since I really just didn’t like them that much. 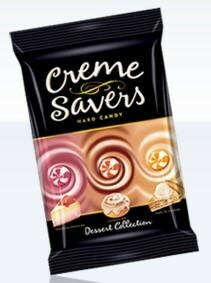 However, browsing the candy aisle in Walgreens, I gave into curiosity and decided to purchase some of the LifeSaver spin-offs, CrÃ¨me Savers. CrÃ¨me Savers debuted in 1988 and come in a variety of flavors, but I was particularly drawn to the alluring bag of the desserts collection containing Apple Pie A La Mode, Strawberry Cheesecake, and Cinnamon Bun. As we all know, Hershey’s Kisses celebrated its 100th birthday this past year, withstanding the test of confectionery time. Here at Candy Addict we’ve followed the recently limited editions that Hershey’s has rolled out in celebration of the Kisses centennial. With flavors like Strawberry Creme, Candy Corn, Malt, Coffee, etc., how could Hershey possible introduce something new to the Kisses line? I found the answer to that question toward the end of the year, in the form of larger-than-normal-sized Kisses that come in a pack at the checkout counter. This is a bold marketing move on Hershey’s behalf. For years Hershey has tried to find a profitable way to sell Kisses in other forms than the large bags but with limited success. 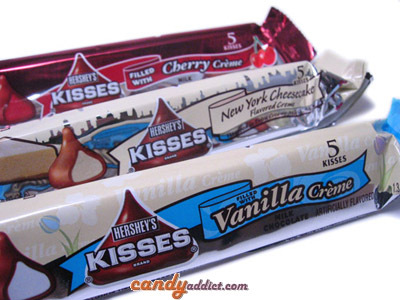 A few years ago Kissables made a debut and they partly solved the problem with the cute size and crunchy candy shell. Kissables still aren’t the Hershey Kisses we all know and love though, they’re really more like a step-sibling. With the induction of these new larger Kisses in the single pack however, I think Hershey has found a solution to their longtime dilemma. Prior to this year, I’ve only seen the Chocolate Truffle variety available in this new larger size and packaging. That all changed when I was in my local pharmacy the other day and I discovered not one, but three new flavors of this new breed of Kiss: Cherry Creme, New York Style Cheesecake and Vanilla Creme.